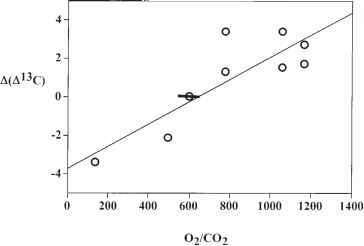 where c = intercellular CO2 concentration ca = CO2 concentration in the external air a = A13C that occurs during diffusion through the stomata (4.4%o) b = A13C for the fixation of CO2 by Rubisco (27-29%). An increase of cb due to CO2 accumulation as a result of being out-competed by rising O2, should, therefore, lead to a rise in A13C. Laboratory experiments with growing plants verify this prediction (Berry et al., 1972; Beerling et al., 2002). The measured fractionation A13C between atmospheric CO2 and plant carbon has been found to be proportional to the ratio O2/CO2 (figure 6.9). This is exactly what would be predicted from equation (6.22) and the above discussion. This observation suggests that the fractionation of carbon isotopes, as recorded by plant fossils, might be used to deduce ancient levels of atmospheric O2, providing that an independent estimate of atmospheric CO2 could be made. However, even without any CO2 data, it is still possible to use qualitatively the idea that higher concentrations of atmospheric O2 would lead to greater fractionation. To test this idea, measurements of 813C for 41 plant fossils ranging in age from Devonian to Cretaceous were performed (Beerling et al., 2002). To be able to determine A13C, values of 813C for atmospheric CO2, of the same age as each plant fossil, were calculated from data for surface water oceanic carbon, as recorded by carbonate fossils (Veizer et al., 1999). The S13C value for atmospheric CO2 should exhibit a constant difference with oceanic S13C because of rapid air-water exchange and equilibration (Cerling, 1991; see equation 5.13). Results for A13C, based on plant fossil measurements for the Devo-nian-Triassic are shown in figure 6.10 and compared with predicted values from RROD isotope mass balance modeling. The good agreement gives further support to the hypothesis that levels of atmospheric O2/ CO2 were unusually high at this time and that these high levels brought about an increase in photosynthetic carbon isotope fractionation. The recent study of a much larger number of plant fossils and terrestrial organic matter by Peters-Kottig et al. 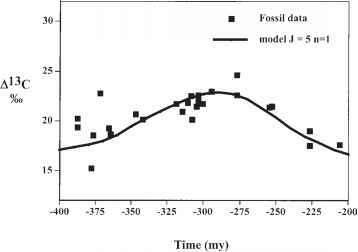 (2003) also found increased frac-tionation during the late Paleozoic and ascribed it to elevated O2/CO2. 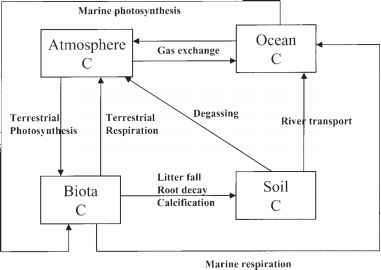 These studies illustrate how the study of plant physiology supplements geochemical modeling in examining the history of atmospheric O2. plant growth laboratory experiments at these levels and at ambient (360 ppm) CO2. 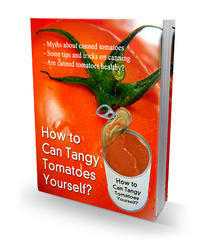 The results were that at 35% O2, plant net primary production decreased by about 20%. This shows that at such a high level of O2, plant growth is inhibited but that plants are not killed, at least not on a month-to-year time scale. Furthermore, calculations by Beerling and Berner (2000) indicate that raising the concentration of atmospheric CO2, at thePermo-Carboniferous O2 maximum, from 300 ppm to 450 ppm, a value permitted by the errors of GEOCARB modeling, results in a rate of net primary production that is essentially the same as under present-day, preindustrial conditions (300 ppm CO2, 21% O2). This is not unexpected because the preindustrial present-day ratio of O2/CO2 (210,000 ppm/300 ppm) is reasonably close to that hypothesized for the Permo-Carboniferous O2 maximum (350,000 ppm/450 ppm).